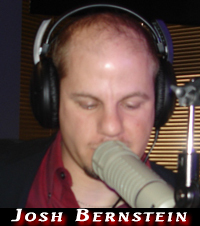 Radio Talk Show Host, Writer, and Political Strategist Josh Bernstein was born and raised in Northern New Jersey. He is the youngest of three children. He grew up in a predominately liberal household in an upper middle class suburban neighborhood about 23 miles south of New York City. He is a divorced father of one amazing eight year old boy who provides all the motivation he needs to continue in the fight to save the country. He currently resides in Arizona where he is raising his son. He is a Pro Christian Jewish Conservative who detests Anti-Semitism just as much as Christian bias. A published writer at a very young age, initially his passion was for poetry. However, his focus and passion all changed with the events of September 11, 2001. This single event inspired him to pursue his passion for Patriotism, Conservatism, and American pride. Josh first made a name for himself with his unabashed, unafraid, and unapologetic writing style on the likes of Examiner.com, The Tea Party Tribune, Brietbart News, Right Wing News, Conservative Daily News, and Conservative Read. His articles lead him to numerous guest appearances on some of today’s best conservative talk shows and to the formation of the very successful Grit and Grace Show with former co-host Jennifer Meadows. Josh is also the Director of Campaign Communications for Candidate Vetting for The Tea Party Community. This allows him access to some of the biggest names running for Congress. Josh has interviewed just about everyone running for Congress as well as some other big name notables in Conservative Politics. Josh has interviewed Television stars, radio stars, Former White House Officials, Former Military Commanders and Generals, even a few folks on the right from Hollywood. With no real leadership in the White House or Congress, and a Democratic Party that treats the Constitution like toilet paper our country is in great peril. Liberalism, Progressivism, Collectivism, and Socialism are destroying our country like a 21st Century plague.